If you are a long time reader of Mom 4 Real, then you know I love to share tons of homemade cleaning recipes. 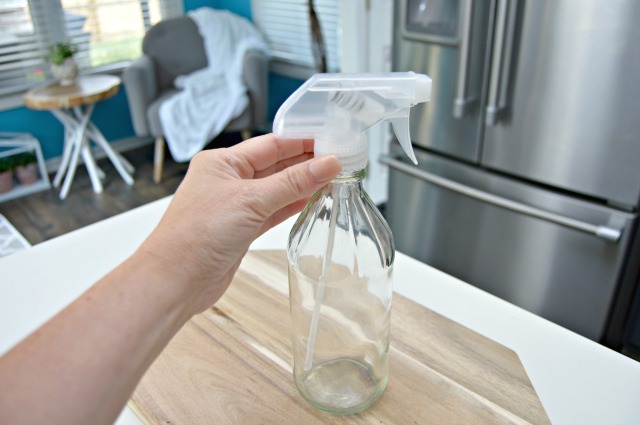 Some homemade cleaners really need to be stored in glass instead of plastic, but glass spray bottles can be pretty pricey. This post contains affiliate links, which means if you make a purchase using one of these links, I will receive a small commission. My favorite one costs around $7 if you buy it online. If you want to make several different kinds of cleaners, then paying close to $7 each for glass spray bottles may not be in your budget. No worries, friends! 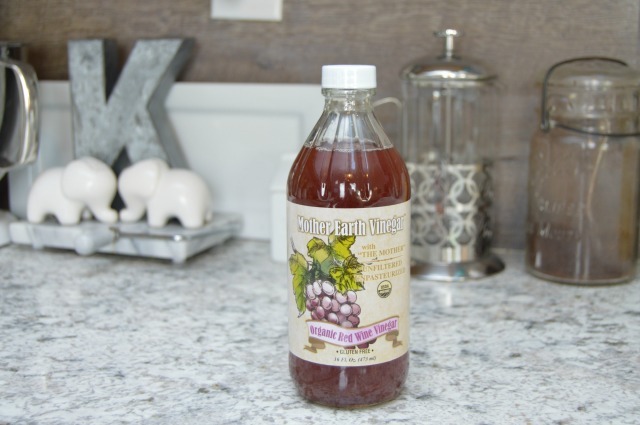 I have the perfect fix…let me show you how to make a glass spray bottle for homemade cleansers for just a couple of dollars! If you’d like to buy your glass spray bottles instead of making your own, you purchase the Glass Spray Bottles I use HERE! To make your own glass spray bottle, you are going to need to find a glass container that will fit a sprayer. I like to use vinegar bottles. For this bottle, I found this Organic Red Wine Vinegar in a glass bottle on my latest trip to Homegoods. (You can also find these at TJ Maxx and Marshalls in their gourmet foods section) I needed red wine vinegar for a salad dressing I was making, so this worked perfectly for me. You can find vinegar in glass bottles at the grocery store too. I simply poured my red wine vinegar into a mason jar to store. 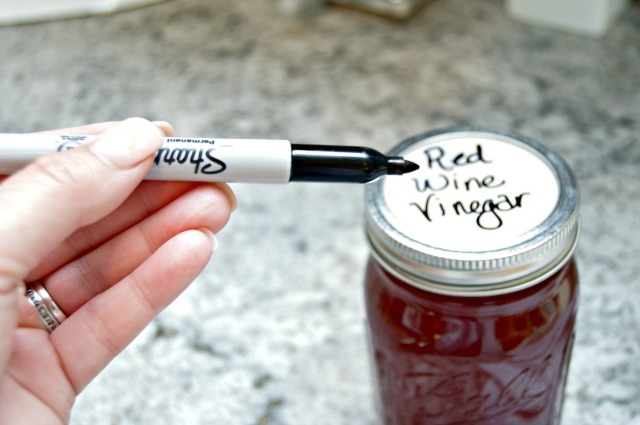 A great tip for labeling mason jars is to flip the mason jar lid upside down and use a sharpie marker to write down what is inside. You can also write the expiration date so you know when to throw it out or use it by. Once you have emptied your glass bottle, wash the inside of it well . Once my glass bottle is clean, I like to fill it with soapy water. You will see why in the next step. Now, coat the label on the bottle with either olive oil or whatever oil you have on hand. Fill your sink or a small tub with warm water and add about a tablespoon of dish liquid. 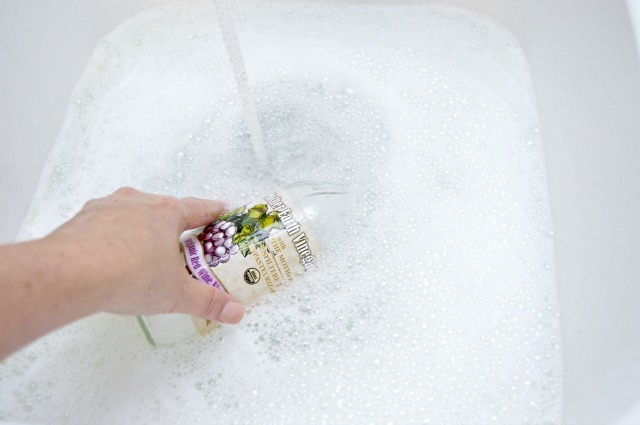 Submerge your bottle in the warm, soapy water and leave for 30 minutes. The reason I filled the bottle with water was to keep it from floating to the top. Once your glass bottle has soaked for 30 minutes, take it out of the water and peel the label off of your glass bottle. 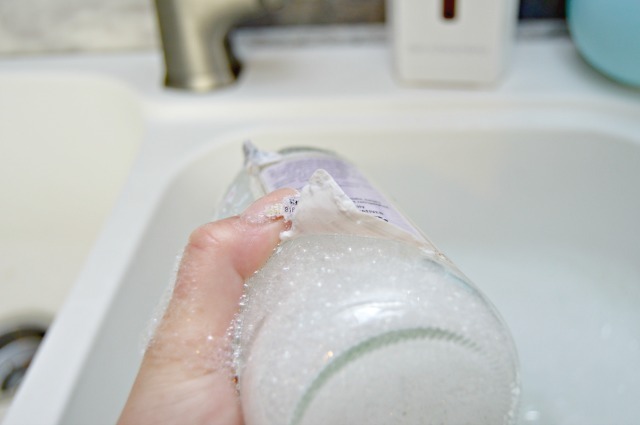 Now, take a clean spray bottle lid from an old plastic spray bottle and screw onto the top of your glass bottle. If you don’t have one, simply buy a spray bottle or cleanser from the Dollar Store and rinse well. These spray bottle lids screw right onto the vinegar bottles…whoop! 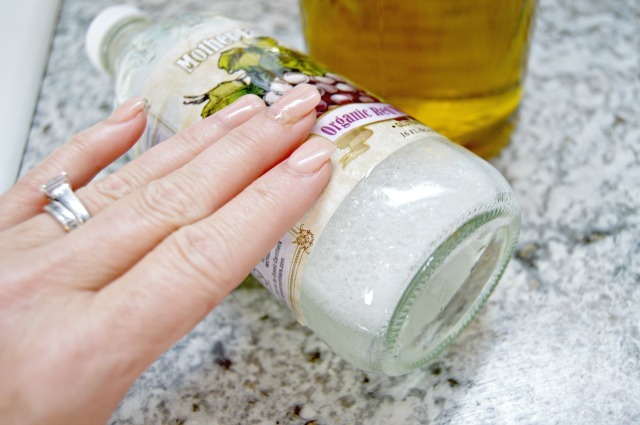 Now, fill your glass bottle with your favorite homemade cleanser and have at it! You can now make multiple glass spray bottles without breaking the bank. They are reusable and so nice and pretty too! You can print my Cleaning Labels too if you’d like to use them, HERE! 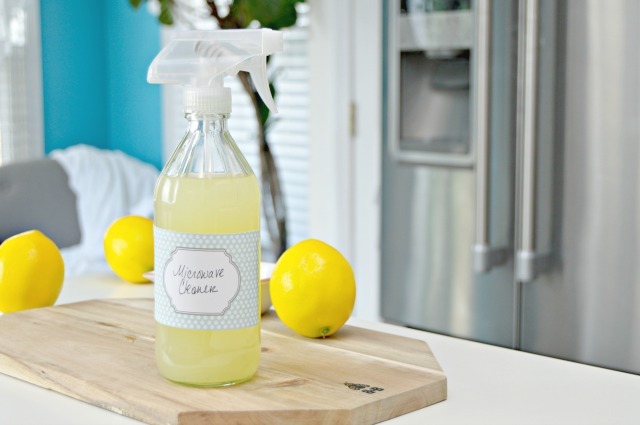 Looking for more home tips and cleaning recipes to add to your new homemade glass spray bottles? 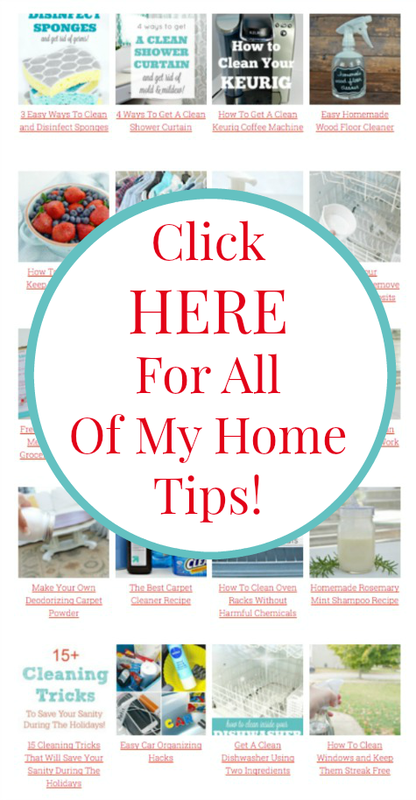 You can find them all on my Home Tips Page, HERE! Great idea to repurpose bottles. Thanks for the tip. Now it is summer and windows are open I see how much they need to sparkle. Jess, I’m not easily impressed. But you my dear are a rock star. Best DIY blogger out there. Thank you for all you do! Why not use the original plastic bottle? Glass is much heavier, and if they brake they cause a LOT more trouble and maybe even blod will be shared. Plastic bottles may deteriorate when storing anything made with essential oils, like tea tree or lemon essential oils. Better to be safe than sorry when the plastic bottle leaks all over your cabinet and possibly damages the finish on your cabinet. Glass won’t disintegrate like plastic.